In the western yoga movement, it has become common to find people chanting, singing and praising God in Sanskrit as an important adjunct to a physical (raja) yoga practice. Many Indian masters have declared this form of spiritual worship (which falls under bhakti yoga) to be the easiest and fastest route to enlightenment, for as one chants, the heart chakra expands, effortlessly flooding the being with light. What may often be overlooked, however, is the importance of the particular sound vibrations used, for it is not merely the act of chanting but more importantly the use of Sanskrit that produces profound change within people. In fact, vedic literature declares that Sanskrit chanting is an extremely enjoyable, powerful way for people to transform and awaken, a magical vehicle for accessing higher states of consciousness. It is widely believed that Sanskrit is the oldest extant language on earth, stemming roughly from around three to five thousand years ago. Considered to be the basis of many of the world’s languages, Sanskrit has ties to Greek, Latin, the Romance languages, and Middle Eastern languages. 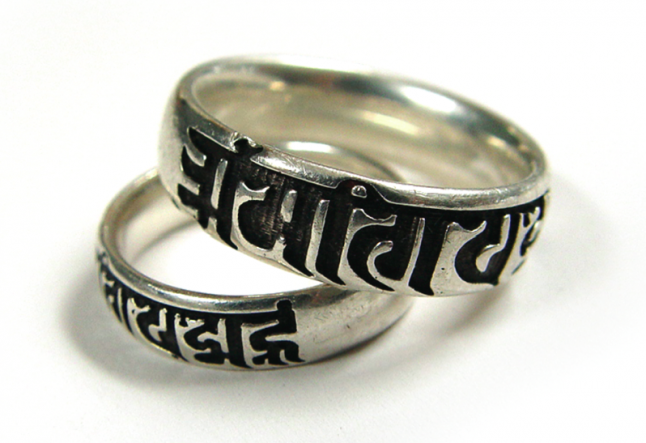 The word “Sanskrit” means “refined,” “joined together” or “perfect,” indicating that it is a highly regulated and orderly language in terms of its grammar. Linguists have identified approximately 54 basic vibrations, and found that Sanskrit stems from these original sounds, while all other languages then emerged from these sound patterns, but eventually became more and more removed from the source. There is a mythological story about the derivation of Sanskrit that deserves mention. According to this account, Lord Brahma (the creative force of the Divine) spoke vedic knowledge in Sanskrit to the devas (higher beings) who in turn passed the information on from the heavenly spheres to mystics who were deep in meditation, living in a pristine state and attuned to subtle energies. Thus Sanskrit is a “heard” language and referred to as devanagari from “deva” meaning “god” and “nagari” meaning “city,” and translated as “the language of the gods.” The holy seers recorded all of the vedic texts in Sanskrit, much like early European spiritual texts were written in Latin, with priests serving as the keepers of Sanskrit. Like Latin, Sanskrit was not a spoken language, but rather a language in which prayers and mantras were written and chanted. Today we are rediscovering this beautiful language with its mystical abilities to produce healing. For yogis, what may be most interesting is that Sanskrit has the ability to actually create healing through its vibration, since Sanskrit mantras directly affect the chakras, organs and nervous system. Although it is certainly important to understand the meaning of chants, their power lies mostly in the actual sounds themselves, that mystically allow blessings to manifest around and within us. By working with Sanskrit chants, we erase ill karma, cleanse our minds and emotions of negative patterns, and create new, positive conditions. Repeated use of Sanskrit chants liberates us from the material world, so that we may eventually escape the cycle of reincarnation. The rapport between sound and consciousness has long been recognized, and indeed all religions seem to employ some type of chanting. The Bible states: “In the beginning was the Word and the Word was God,” an undoubted reference to this phenomenon of sound being equated with the divine. Unfortunately today we are so bombarded by noise pollution that it is difficult to tune in to subtle, “unheard” energies. However, it is not impossible. The use of Sanskrit chanting helps us create a bridge between the physical and metaphysical realms where we can touch gentle, healing energies that uplift both ourselves and the universe at large.